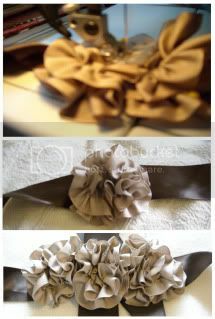 – 1.5 – 2 yards of a 1.5" wide satin ribbon. 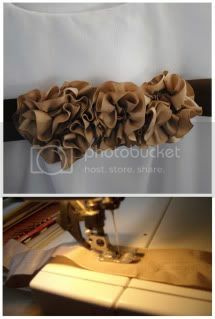 – 1 yard of a 1" wide ribbon. Step 1: Cut widest ribbon (for the sash) to desired size – I did 1.5 yards per sash which allowed for a nice bow to be tied in the back of the sash. 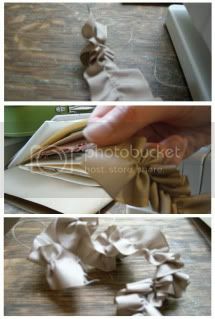 Use scissors to angle the ribbon's ends or cut inverted V's – this will help to prevent fraying. Step 2: Cut narrower ribbon into 1.5"-2" long pieces – try to cut an odd number of lengths (these will become the ribbon roses and they look best grouped in odd numbers). 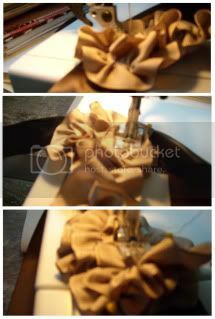 Step 3: Gather your ribbons to create roses. 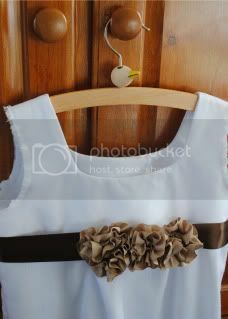 Do this by: setting your sewing machine to a long basting stitch. Stitch one long seam down the center of each length of ribbon – DO NOT backstich to secure the ends. Just leave long lengths of thread at each end to pull on later. *Advanced sewers, tighten the tension and keep the thread length normal – this will automatically create a gather in the ribbon. Step 4: Use your fingers to gently pull one thread on one end of teach ribbon piece – this will gather the fabric. Gather as desired – it will naturally begin to curl into a rose shape. Step 5: Use pins to secure each ribbon rose into place on the sash. The best way to do this without going crazy is to do one rose at a time. Pin, sew, remove pins – repeat with the next rose. Step 6: SLOWLY stitch each rose on to the sash. This will be a little messy (and VERY SLOW) since you will need to move each upper layer out of the way as you stitch the lower layer. Remember to backstitch to secure the ends. Remove pins. Repeat with each rose (as desired). Step 7: Enjoy! With longer lengths, this project would look great on the bride or the bridal party!